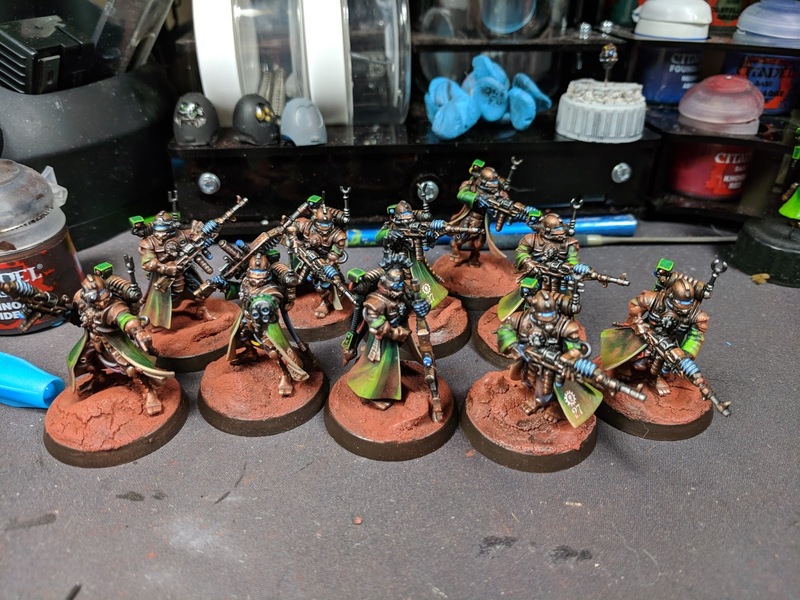 The second squad of Skitarii Vanguard are all finished and based! I'm really happy with how they turned out, but at the same time so glad that they are out of my hair (or lack there of). These guys blow the first squad, which was painted last year and used a different recipe for my copper metals, out of the water. It is a noticable difference in copper color too. But I've become O.K. with that. One thing that does kind of sadden me is that they don't have any skeleton bits on their bases, as I ran out of skeleton miniatures to cut up. More are on the way for the robots and display board now though. 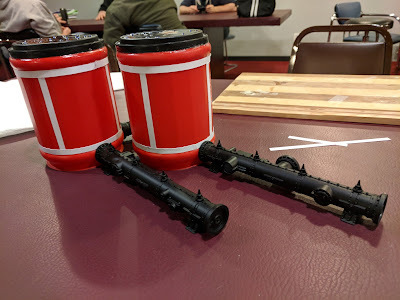 Last Wednesday night I took some hobby supplies to the game shop and hung out while working on the sludge vats. I took some plasticard and glued it to the sides in strips to make it look like banding holding the vats together. It was an exercise in frustration, as I kept gluing them to myself and the glue didn't really like the plastic of the Folgers cans. Either way, I'm happy with them so far and just need to get something to use as rivets. I might use pins, like I usually do and cap off the bottoms, so people don't accidentally poke themselves with them by reaching inside. But I haven't decided. On Monday's stream with Hobbyistgirl, I started working on the actual Sydonian Dragoon miniature. 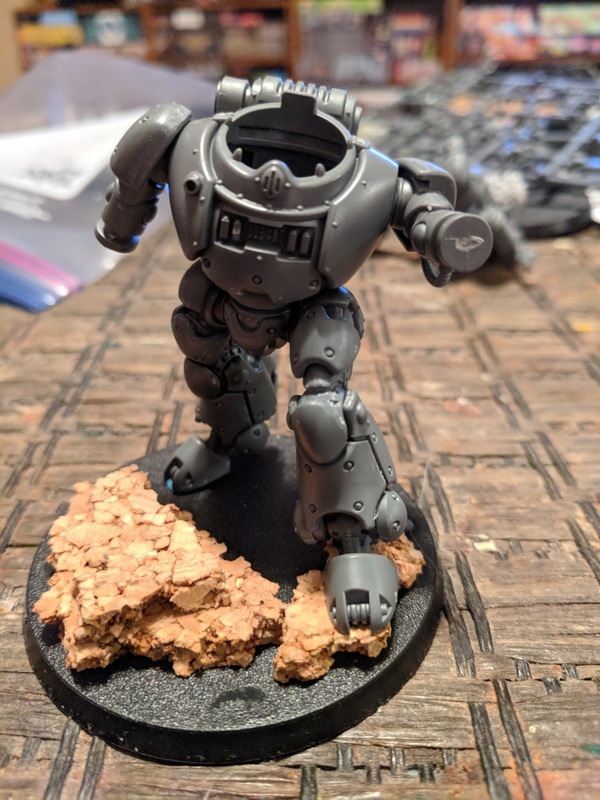 I started with the legs and go them to the point where I could glue it do the base, so I didn't have to man handle it anymore. I almost made the mistake of gluing it down before I weathered the feet, but realized what I was doing and gave it a quick sponging. He's coming along well and I've started on the green armor plating now. The hardest part is looking over the original Dragoon and trying to decipher how I painted it, especially the thigh plates. 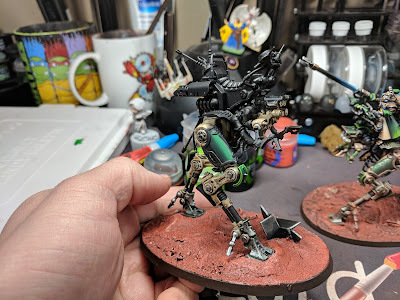 The bone color of the legs is slightly different and at first it bothered me, but it should be fine once he's done, they won't be next to each other all the time anyway. In some downtime I started putting together the 3rd robot body for the recast heads. In my unhelmed robots, I had one that was in a sort Captain Morgan pose. On these ones, I wanted one in a bent knee pose as well, but more like he was bracing to fire. I really like how this pose looks and can't wait to paint him up. I think he'll be the next robo painted. 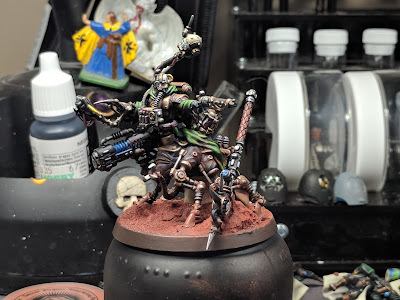 Last but not least, is the Tech-Priest Dominus conversion. Previously, I have called him finished, but then the Adepticon Friendly rules came out and from the sounds of Adepticon's blanket rules, it is strictly "what you see is what you get" and any models found to be in violation can cause you to become disqualified. With that in mind, I decided that I needed to add a force axe to him some how. I knew that I couldn't add it to him with an extra arm. There just wasn't enough room on him for it. That's when I had the idea to make it buried in the dirt next to him. 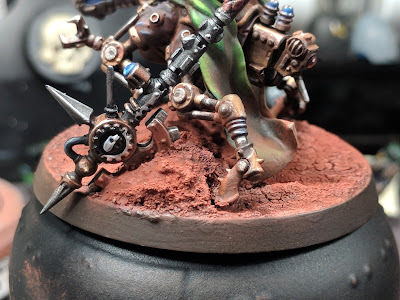 I cut the original Dominus axe off of a custom Tech-Priest Enginseer that I had been working on and re-worked it a little bit. I then cut the axe blade and "buried" it into the ground with some fresh green stuff work. A bit of extra paint and such and it was all done! The new ground section actually blended in much better than I expected it to also, which is a huge bonus. And now he has all of his weapons on him, as he should have had in the first place. That's all for this week. The pressure is on as a local Warhammer 40,000 tournament and Adepticon draw nearer by the day. I need to have the Sydonian Dragoon ready for next week Saturday, and the rest of my Robos ready for Adepticon exactly a month from then. Will I be able to pull it off? Check back next week for more progress reports and as usual, keep an eye on Twitter and Instagram for progress as it happens. Great work! I really like the colour scheme you've gone for with the army. The subtle green works very well with the red base and metal areas. Looking forward to seeing how the sludge vats turn out. I love a good scratch built terrain project! Thanks sir, I'm really glad that I went with this color scheme over my original idea of copper and red. It gets a lot of compliments, especially the green.